Machine-learning research has detected seismic signals accurately predicting the slow slipping of the Cascadia fault. It has also found similar signals predicting slow slip failure in Chile and New Zealand. Los Alamos National Laboratory researchers applied machine learning to analyze 12 years of historic Cascadia data. Cascadia’s constant tremors produce an acoustic signal, like sound waves. The key to Cascadia’s behavior was buried in that acoustic data. Paul A. Johnson, et al. We present an approach based on machine learning (ML) to distinguish eruption and precursory signals of Chimayó geyser (New Mexico, U.S.A.) under noisy environmental conditions. This geyser can be considered a natural analog of CO2 intrusion into shallow water aquifers. By studying this geyser, we can understand upwelling of CO2-rich fluids from depth, which has relevance to leak monitoring in a CO2 sequestration project. ML methods such as random forests (RFs) are known to be robust multiclass classifiers and perform well under unfavorable, noisy conditions. However, the extent of the RF method’s accuracy is poorly understood for this CO2-driven geysering application. The current study aims to quantify the performance of RF classifiers to discern the geyser state. We present an approach based on machine learning (ML) to distinguish eruption and precursory signals of Chimayó geyser (New Mexico, U.S.A.) under noisy environmental conditions. This geyser can be considered a natural analog of CO2 intrusion into shallow water aquifers. By studying this geyser, we can understand upwelling of CO2-rich fluids from depth, which has relevance to leak monitoring in a CO2 sequestration project. ML methods such as random forests (RFs) are known to be robust multiclass classifiers and perform well under unfavorable, noisy conditions. However, the extent of the RF method’s accuracy is poorly understood for this CO2-driven geysering application. The current study aims to quantify the performance of RF classifiers to discern the geyser state. Toward this goal, we first present the data collected from the seismometer that is installed near the Chimayó geyser. The seismic signals collected at this site contain different types of noises such as daily temperature variations, animal movement near the geyser, and human activity. First, we filter the signals from these noises by combining the Butterworth high-pass (BH) filter and an autoregressive (AR) method in a multilevel fashion. We show that by combining these filtering techniques in a hierarchical fashion leads to a reduction in noise in the seismic data without removing the precursors and eruption event signals. We then use RF on the filtered data to classify the state of geyser into three classes: remnant noise, precursor, and eruption states. RF classifier is constructed based on the comprehensive features extracted using the Tsfresh Python package. We show that the classification accuracy using RF on the filtered data is greater than 90%. We also evaluate the accuracy of other classical time-series methods such as dynamic time warping (DTW) on filtered data along with RF on partially filtered data in which we remove the daily trends. Classification accuracy shows that DTW performs poorly (44%) and RF on partially filtered data performs decently (87%). Denoising seismic signals from both daily trends and human activity enhances RF classifier performance by 7%. These aspects make the proposed ML framework attractive for event discrimination and signal enhancement under noisy conditions, with strong potential for application to monitor leaks in CO2 sequestration. Correctly determining the association of seismic phases across a network is crucial for developing accurate earthquake catalogs. Nearly all established methods use travel-time information as the main criterion for determining associations, and in prob- lems in which earthquake rates are high and many false arrivals are present, many standard techniques may fail to resolve the problem accurately. As an alternative approach, in this work we apply convolutional neural networks (CNNs) to the problem of associations; we train CNNs to read earthquake waveform arrival pairs between two stations and predict the binary classification of whether the two waveforms are from a common source or different sources. Bernard Rouet-Leduc, Paul A. Johnson, et al. Tectonic faults fail in a spectrum of modes, ranging from earthquakes to slow slip events. 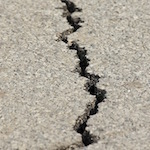 The physics of fast earthquakes are well described by stick–slip friction and elastodynamic rupture; however, slow earthquakes are poorly understood. Key questions remain about how ruptures propagate quasi-dynamically, whether they obey different scaling laws from ordinary earthquakes and whether a single fault can host multiple slip modes. We report on laboratory earthquakes and show that both slow and fast slip modes are preceded by a cascade of micro-failure events that radiate elastic energy in a manner that foretells catastrophic failure. Tectonic faults fail in a spectrum of modes, ranging from earthquakes to slow slip events. The physics of fast earthquakes are well described by stick–slip friction and elastodynamic rupture; however, slow earthquakes are poorly understood. Key questions remain about how ruptures propagate quasi-dynamically, whether they obey different scaling laws from ordinary earthquakes and whether a single fault can host multiple slip modes. We report on laboratory earthquakes and show that both slow and fast slip modes are preceded by a cascade of micro-failure events that radiate elastic energy in a manner that foretells catastrophic failure. Using machine learning, we find that acoustic emissions generated during shear of quartz fault gouge under normal stress of 1–10 MPa predict the timing and duration of laboratory earthquakes. 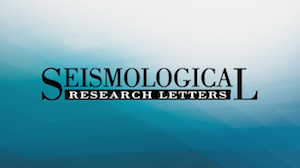 Laboratory slow earthquakes reach peak slip velocities of the order of 1 × 10−4 m s−1 and do not radiate high-frequency elastic energy, consistent with tectonic slow slip. Acoustic signals generated in the early stages of impending fast laboratory earthquakes are systematically larger than those for slow slip events. Here, we show that a broad range of stick–slip and creep–slip modes of failure can be predicted and share common mechanisms, which suggests that catastrophic earthquake failure may be preceded by an organized, potentially forecastable, set of processes. Bertrand Rouet-Leduc, Paul A. Johnson, et al. Tectonic faults slip in various manners, which range from ordinary earthquakes to slow slip events to aseismic fault creep. Slow slip and associated tremor are common to many subduction zones, and occur down-dip from the neighbouring locked zone where megaquakes take place. In the clearest cases, such as Cascadia, identified tremor occurs in discrete bursts, primarily during the slow slip event. Here we show that the Cascadia subduction zone is apparently continuously broadcasting a low-amplitude, tremor-like signal that precisely informs of the fault displacement rate throughout the slow slip cycle. Using a method based on machine learning previously developed in the laboratory, we analysed large amounts of raw seismic data from Vancouver Island to separate this signal from the background seismic noise. We posit that this provides indirect real-time access to fault physics on the down-dip portion of the megathrust, and thus may prove useful in determining if and how a slow slip may couple to or evolve into a major earthquake. Machine learning regression can predict macroscopic fault properties such as shear stress, friction, and time to failure using continuous records of fault zone acoustic emissions. Here we show that a similar approach is successful using event catalogs derived from the continuous data. Our methods are applicable to catalogs of arbitrary scale and magnitude of completeness. We investigate how machine learning regression from an event catalog of laboratory earthquakes performs as a function of the catalog magnitude of completeness. We find that strong model performance requires a sufficiently low magnitude of completeness, and below this magnitude of completeness, model performance saturates. Seismologists analyze faults in the earth by creating earthquake catalogs‐records of the times, locations, and sizes of earthquakes. For decades, researchers have attempted to use the these catalogs to predict the timing and size of future earthquakes. Recently, researchers have found that machine learning algorithms can forecast the motion of the fault using subtle “creaking” sounds, both in the laboratory and in the real world. These creaking sounds had previously been thought to be noise and were not commonly cataloged as earthquake activity. We installed a very powerful sensor in a laboratory fault and created a very detailed catalog that captures very small quakes—small enough that they would have looked like noise to a less powerful sensor. We then used machine learning on this catalog to try and forecast the large laboratory earthquakes. We found that machine learning model is successful when small‐enough events are part of the catalog. This says that subtle seismic sounds that look like noise may be very small earthquakes that were previously overlooked. These findings suggest that to improve earthquake forecasting, we might broaden our ideas of what signals to label as potential earthquakes and save in catalogs. Nearly all aspects of earthquake rupture are controlled by the friction along the fault that progressively increases with tectonic forcing but in general cannot be directly measured. We show that fault friction can be determined at any time, from the continuous seismic signal. In a classic laboratory experiment of repeating earthquakes, we find that the seismic signal follows a specific pattern with respect to fault friction, allowing us to determine the fault’s position within its failure cycle. Using machine learning, we show that instantaneous statistical characteristics of the seismic signal are a fingerprint of the fault zone shear stress and frictional state. Further analysis of this fingerprint leads to a simple equation of state quantitatively relating the seismic signal power and the friction on the fault. These results show that fault zone frictional characteristics and the state of stress in the surroundings of the fault can be inferred from seismic waves, at least in the laboratory. In a laboratory setting that closely mimics Earth faulting, we show that the most important physical properties of a fault can be accurately estimated using machine learning to analyze the sound that the fault broadcasts. The artificial intelligence identifies telltale sounds that are characteristic of the physical state of the fault, and how close it is to failing. A fundamental relation between the sound emitted by the fault and its physical state is thus revealed. We apply machine learning to data sets from shear laboratory experiments, with the goal of identifying hidden signals that precede earthquakes. Here we show that by listening to the acoustic signal emitted by a laboratory fault, machine learning can predict the time remaining before it fails with great accuracy. These predictions are based solely on the instantaneous physical characteristics of the acoustical signal and do not make use of its history. Surprisingly, machine learning identifies a signal emitted from the fault zone previously thought to be low-amplitude noise that enables failure forecasting throughout the laboratory quake cycle. We infer that this signal originates from continuous grain motions of the fault gouge as the fault blocks displace. We posit that applying this approach to continuous seismic data may lead to significant advances in identifying currently unknown signals, in providing new insights into fault physics, and in placing bounds on fault failure times. Predicting the timing and magnitude of an earthquake is a fundamental goal of geoscientists. In a laboratory setting, we show we can predict “labquakes” by applying new developments in machine learning (ML), which exploits computer programs that expand and revise themselves based on new data. We use ML to identify telltale sounds—much like a squeaky door—that predict when a quake will occur. The experiment closely mimics Earth faulting, so the same approach may work in predicting timing, but not size, of an earthquake. This approach could be applied to predict avalanches, landslides, failure of machine parts, and more. “I am actually hopeful for the first time in my career that we will make progress on this problem,” said Paul Johnson, a fellow at the Los Alamos National Laboratory who is among those at the forefront of this research. Scientists used big data sets and machine learning to study rocks under pressure in a lab. The experiments looked at vibrations that preceded a major break in the rock. This was an analog to what happens in nature, where, below a subduction zone, rocks slip, creating vibrations. The new paper says that researchers have been able to pick up the continuous signal of slow slip at the base of the subduction zone and separate that from the noise of the natural environment. This “continuous chatter,” the scientists argue, “may prove useful in determining if and how a slow slip may couple to or evolve into a major earthquake. For the first time, the magnitude, time and duration of earthquakes in a laboratory setting were predicted by researchers from Penn State and Los Alamos National Lab. For the first time, the magnitude, time and duration of earthquakes in a laboratory setting were predicted by a team of researchers from Penn State and Los Alamos National Laboratory. This research improves our understanding of earthquakes and could eventually lead to prediction measures in real-life scenarios, according to the researchers who published their results in a recent issue of Nature Geosciences. For decades, researchers have been able to create earthquakes in a lab setting. However, finding a pattern of when they will occur has remained elusive. For this work, researchers used machine learning — a computer-based approach to data analysis — to probe for the missing cues. The machine learning approach predicted when the earthquakes would strike by looking at acoustic signals generated each time the earthlike medium moved. The acoustics showed a pattern of increasing intensity as the lab earthquakes ramped up in strength. These acoustical signals have long been considered noise, especially early in the earthquake cycle, because a pattern proved difficult to find. "You can make earthquakes in the lab in such a regular fashion that you can kind of predict them but that's not what was happening," said Chris Marone, Penn State. "Machine learning keyed us into listening to the sounds that are coming out of the fault. The method tells us when the next earthquake will occur and how long until the following one comes." A series of earthquakes was created in the lab by sandwiching a layer of sheared granular material between two pieces of rock. 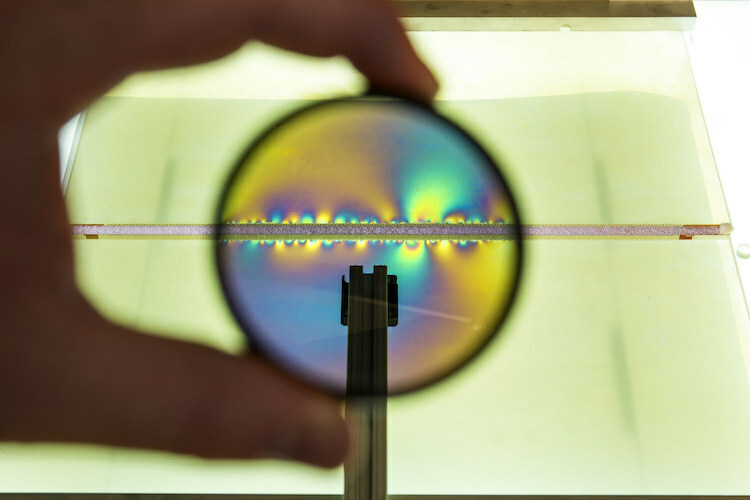 The researchers created both slow- and fast-slip earthquakes to understand if the mechanics of each were similar. Fast-slip earthquakes, which are thought of as traditional earthquakes, operate at high speeds and can cause massive amounts of damage to structures. Slow-slip earthquakes operate in a similar fashion but at speeds hundreds to thousands of times slower. For example, a fast-slip earthquake might last for seconds as fault surfaces rip past one another. However, a slow-slip event could take months to cover the same distance along fault lines. Traditional earthquakes have been studied for many decades yet slow earthquakes were just identified about two decades ago. This research shows that the mechanics of each, and the methods for prediction, are the same. Seismometers capture acoustic signals, so most areas susceptible to earthquakes create the same data used in these lab predictions. However, researchers do not yet know if the same methods will work in a real-life setting because the current approach requires a series of similar earthquakes to train the machine learning algorithm. This method could work in places such as the Cascadia subduction zone in the U.S. Northwest, where a string of earthquakes has occurred within the past decade, however most earthquake-prone regions are less active. "It's not clear if our technique will work in the field because there are very few places on Earth where we have had multiple, similar earthquakes in the same place, but we're going to find out" Marone said. "Most times, the earthquakes on a tectonic plate boundary are all different. A famous example is the San Francisco earthquake of 1906. That hasn't occurred since." Researchers do not yet know if the same methods will work in a real-life setting because the current approach requires a series of similar earthquakes to train the machine learning algorithm. Looking at any prediction measures could point researchers in the right direction, Marone said. His group is now applying the same machine-learning techniques to probe other ways of predicting earthquakes. This new research could yield methods that require less data. "Right now, we're taking our lab data and applying different machine learning approaches to see if we can spot some transitions or characteristics that yield the same results," Marone said. Claudia Hulbert, Bertrand Rouet-Leduc, Paul Johnson and Christopher Ren, of Los Alamos National Laboratory, and Jacques Rivière and David Bolton, of Penn State, contributed to this research. The U.S. Department of Energy and the National Science Foundation supported this research. By listening to the acoustic signal emitted by a lab-created earthquake, a computer science approach using machine learning can predict how long until a fault fails. LOS ALAMOS, N.M., Aug. 30, 2017—By listening to the acoustic signal emitted by a laboratory-created earthquake, a computer science approach using machine learning can predict the time remaining before the fault fails. “At any given instant, the noise coming from the lab fault zone provides quantitative information on when the fault will slip,” said Paul Johnson, a Los Alamos National Laboratory fellow and lead investigator on the research, which was published in Geophysical Research Letters. “The novelty of our work is the use of machine learning to discover and understand new physics of failure, through examination of the recorded auditory signal from the experimental setup. I think the future of earthquake physics will rely heavily on machine learning to process massive amounts of raw seismic data. Our work represents an important step in this direction,” he said. Not only does the work have potential significance to earthquake forecasting, Johnson said, but the approach is far-reaching, applicable to potentially all failure scenarios including nondestructive testing of industrial materials brittle failure of all kinds, avalanches and other events. Machine learning is an artificial intelligence approach to allowing the computer to learn from new data, updating its own results to reflect the implications of new information. Machine learning algorithms can predict failure times of laboratory quakes with remarkable accuracy. The acoustic emission (AE) signal, which characterizes the instantaneous physical state of the system, reliably predicts failure far into the future. This is a surprise, Johnson pointed out, as all prior work had assumed that only the catalog of large events is relevant, and that small fluctuations in the AE signal could be neglected. 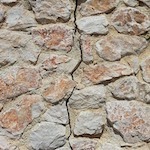 To study the phenomena, the team analyzed data from a laboratory fault system that contains fault gouge, the ground-up material created by the stone blocks sliding past one another. An accelerometer recorded the acoustic emission emanating from the shearing layers. Following a frictional failure in the labquake, the shearing block moves or displaces, while the gouge material simultaneously dilates and strengthens, as shown by measurably increasing shear stress and friction. “As the material approaches failure, it begins to show the characteristics of a critical stress regime, including many small shear failures that emit impulsive acoustic emissions,” Johnson described. “This unstable state concludes with an actual labquake, in which the shearing block rapidly displaces, the friction and shear stress decrease precipitously, and the gouge layers simultaneously compact,” he said. Under a broad range of conditions, the apparatus slide-slips fairly regularly for hundreds of stress cycles during a single experiment. And importantly, the signal (due to the gouge grinding and creaking that ultimately leads to the impulsive precursors) allows prediction in the laboratory, and we hope will lead to advances in prediction in Earth, Johnson said. 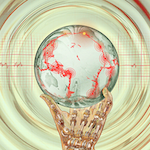 The paper: "Machine learning predicts laboratory earthquakes," Geophysical Research Letters. The funding: Los Alamos National Laboratory Directed Research and Development (LDRD). Can we someday predict earthquakes? New ways of looking at seismic information and innovative laboratory experiments are offering tantalizing clues to what triggers earthquakes—and when. The only thing we know for sure about earthquakes is that one will happen again very soon. Earthquakes pose a vital yet puzzling set of research questions that have confounded scientists for decades, but new ways of looking at seismic information and innovative laboratory experiments are offering tantalizing clues to what triggers earthquakes — and when. Millions of earthquakes shake the globe every year, the ground suddenly lurching in response to movements of the tectonic plates that form Earth’s crust. These plates jostle over, under and against each other as they shift. All that shoving and grinding builds up stress along faults — fractures or breaks in the rock of the crust — until something has to give: an earthquake. The science of seismology seeks to understand what causes earthquakes by tracking their occurrence, measuring their force and using sophisticated imaging technology to probe the subsurface geology where they happen. Today we can locate faults, characterize them and explain many of the stresses building toward their failure. We still don’t fully understand the details inside faults or how those details might control the location and timing of earthquakes, but geophysicists and computer scientists at Los Alamos National Laboratory and their colleagues are wielding an array of new tools to study the interactions among earthquakes, precursor quakes (often very small earth movements) and faults. These tools include aquarium-sized experiments in the laboratory that replicate quakes, more sensitive and more densely deployed seismology instruments worldwide producing vast data streams and supercomputers that can make sense out of this massive data set. Because it’s so hard to observe geologic-scale interactions underground, the Los Alamos team, with collaborators at Penn State, the U.S. Geological Survey, ETH in Zurich and the Institute of Physics of the Globe and the Ecole Normale in Paris, France, has developed laboratory experiments to figure out when faults might fail. Using an “earthquake machine” built by Chris Marone at Penn State, the team is investigating the role that “fault gouge” — the loose material created by the constant grinding at a fault — may play in triggering and influencing the size of quakes. 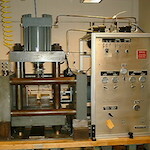 The lab machine creates conditions similar to faults with gouge, then submits them to sound waves as surrogate seismic waves. These experiments have produced strange and startling effects. The team observed that when stress built up on a fault and it approached failure as a miniature earthquake, a series of small precursor quakes rippled through at rates that followed specific patterns. Comparing these results to actual seismic data reveals similar rate failures when precursors are observed before real earthquakes. They also found that the applied sound waves played a key role in triggering laboratory-scale earthquakes by making the gouge more fluid. Amazingly, precursors can trigger major earthquakes thousands of miles away from their origin and often months later. Frequently no precursors are observed before a quake, but that might be because extremely small precursors elude detection. To test that hypothesis, Los Alamos is bringing its supercomputing horsepower to bear on the subject, combing through historical data to see if smaller-magnitude events seemed to signal precursor events preceding temblors in the past. Starting with the lab data on simulated precursor quakes and using a technique called machine learning, Los Alamos is “training” a computer program to sift through this data set and spot precursors. After the computer program has taught itself to recognize precursors, the team will run the program against actual seismic data. The team will then compare the accuracy of those results to more traditional interpretations of the same data. Other data sets from actual seismic monitoring will be added to the experiment in a process called “ground truthing,” intended to verify the computer program’s predictive accuracy. The goal is to develop a computer program that reviews new data in almost real time and spots precursors heralding an upcoming major earthquake. Within the next year or so, the team plans to use the newest computers at Los Alamos, some of the most powerful in the world, to crunch the numbers from larger and larger data sets — first from mining areas, then tectonic regions like the San Andreas fault and finally worldwide — to reveal previously hidden patterns of seismic signals. Dreaming big, the team dares to pursue the Holy Grail of seismology: forecasting major earthquakes. That won’t happen any time soon. The first level of forecasting will be characterizing when an earthquake might happen within some time span. But as supercomputing power continues to grow, it will certainly drive us closer to accurately forecasting massive earthquakes. While Los Alamos maintains technical expertise in seismology and the geodynamics of Earth’s crust as a means of monitoring underground nuclear testing worldwide, that expertise could one day alleviate suffering from unexpected earthquakes on a global scale. 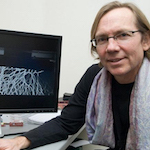 Paul Johnson is a geophysicist, Los Alamos National Laboratory Fellow, a Fellow of the Acoustical Society of America and an American Geophysical Union Fellow in the Laboratory’s Geophysics group. This story originally appeared in The Santa Fe New Mexican. The only thing we know for sure about earthquakes is that one will happen again very soon. An acoustic signal emitted by a lab-created earthquake can help us predict how much time there is before the fault fails. 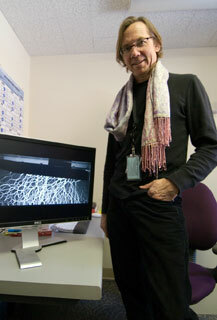 A simulation, captured by a camera with a polarizing lens, represents the structure and dynamics of geological faults. 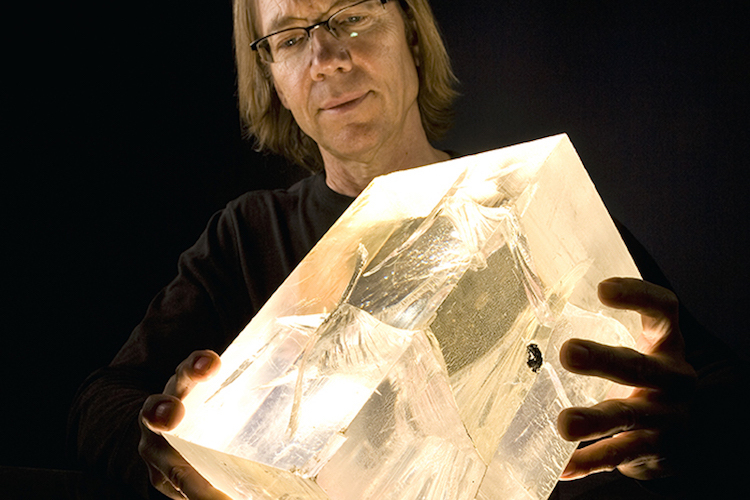 Geophysicist Paul Johnson holds a block of acrylic plastic used to study the dynamic interaction of elastic waves within solids, which may offer clues to understanding earthquakes.